Li River begins at the Cat Mountains in Xing'an county (north of Guilin) and flows through Guilin and Yangshuo, finally entering into West River in Wuzhou, a total length of 437 kilometers. Most Li River Cruises take you along a 54-kilometer stretch of the river from Zhujiang Dock to Yangshuo. The whole boat ride lasts about 4 hours. The Li River Cruise offers you a rare opportunity to enjoy the beauty of the fabulous scenery. 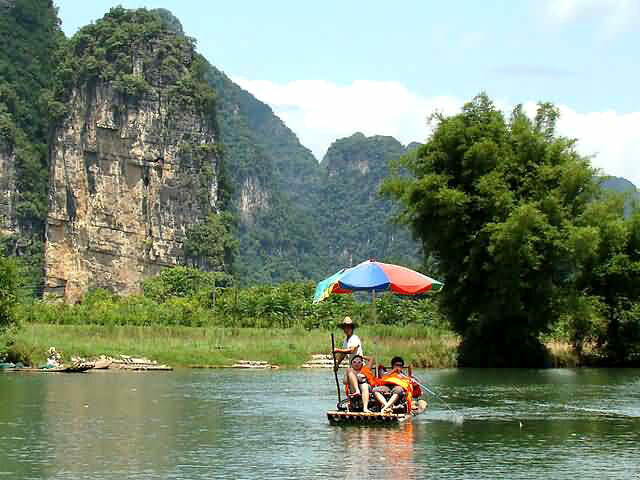 Cruising down the river, you will encounter breathtaking views of fantastic peaks of all shapes and sizes, green hills, and bamboo groves. Even better, you can see these awesome sights reflected from the crystal clear water. The distinctive scenes along the river are world-renowned as the backdrop for Chinese scrolls. Bill Clinton said, "I heard of the name of Li River long ago. Today I visit Li River. It is more vivid and genuine than what I thought before. Nowhere is like Guilin. It makes me think of the traditional Chinese paintings." On the cruise you can also enjoy the beautiful scenes of remote country life in China. Water buffalos patrol the fields; ducks paddle along in the water; peasants reap crops from the rice paddies near their village homes; fishermen use cormorants to catch fish; and children walk along the river singing songs. With its spectacular scenery and vivid country scenery, the cruise offers a refreshing taste of life removed from grey concrete of urban areas.